Boston police controlled detonation: Render safe procedures include disruption and countercharging. How do bomb technicians carry out controlled detonations? 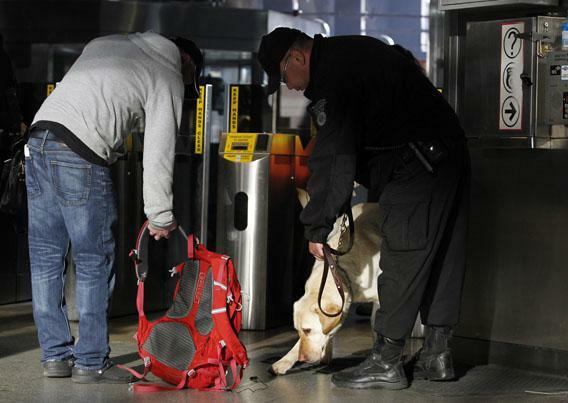 Miller, a member of the Massachusetts Transportation Authority Explosives Detection Unit, sniffs a bag at Back Bay Station as commuters enter the subway system a day after two explosions near the finish line of the Boston Marathon. Massachusetts Gov. Deval Patrick said Tuesday morning that the two improvised explosive devices that exploded Monday near the finish line of the Boston Marathon were the only explosives found in the area. This contradicted earlier reports that police had carried out controlled detonations of other unexploded devices. How do bomb technicians carry out controlled detonations? With an explosive device of their own. Such controlled detonations are very rare. In most cases, bomb technicians aim to disrupt an explosive device—i.e., to break it apart so that it won’t explode. Disruption is preferable to detonation for obvious reasons: It’s less destructive, less dangerous, and more likely to yield useful evidence, since the shattered pieces of the neutralized bomb can be sent to a forensics lab for analysis. (An exploded bomb can still be analyzed, but it’s a lot more complicated.) However, in unusual cases when improvised explosive devices cannot be disrupted and bomb technicians decide the best thing to do is to explode it, the technicians do what’s known as a countercharge: They place another explosive next to the IED and intentionally detonate it to destroy the IED. For countercharges, bomb technicians employ a variety of explosive types and strengths, depending on the type of IED and the context. For the most part, “render safe procedures”—the term used to describe bomb technicians’ efforts to neutralize IEDs—are carried out remotely, via robot. Robots are often equipped with cameras or even X-ray capabilities that allow bomb technicians to examine suspicious packages from afar. Robots can also carry disrupters, which may be precision cutting tools, tools that resemble shotguns or small cannons, or other devices. And should a technician decide to countercharge an IED, the robot can carry that explosive to the IED. Contra cinematic representations, bomb technicians almost never attempt to dismantle an IED manually, a technique known as “hand entry,” because doing so is extremely dangerous. Since actual countercharges are so rare compared to disruptions, “controlled detonation” is a bit of a misnomer in most cases. Confusion can stem from the fact that some disrupters (the ones that resemble shotguns or cannons, for instance) emit loud noises even though their intention is not to explode a bomb to but break it apart without detonating it. Actual controlled detonations were more common in decades past, because without advanced robotic technology, countercharging was the easiest way to render bombs safe. Rudimentary countercharge techniques included drilling a hole into a device, filling it with liquid nitrogen to freeze it, and then taking it to a remote location to destroy it with another bomb. Such methods resulted in the destruction of a lot of evidence, which is why they’re no longer used today. Most American bomb technicians are trained at the FBI’s Hazardous Devices School in Huntsville, Ala., which teaches a three-week basic course and additional adjunct courses for specialists. Bomb technicians are trained to assume that suspicious packages and luggage are explosives, and they sometimes mistakenly countercharge benign objects to err on the side of safety. Explainer thanks Frank Doyle, Jr. of the consulting firm Forensics R Us; John Goodpaster of Indiana University; and Christopher Ronay of the Institute of Makers of Explosives.